we are at the stage where we are seeing hardly any cards we need when we open packs so I thought i'd see if anyone has any swap out there. 91, 93, 96, 99, 119, 120, 127. If anyone has any of these as swaps let me know. We have a huge pile of swaps ourselves, just send us your needs lists. We need the following to complete our two sets. @Speedman29 I can let you have 2*34,64,91,99,106,2*110,121,2*126,2*131,133,1*136,2*140 so all except 1*136 if not already sorted. so hope you have some of these. PM addresses and I’ll get them in the post. @Gibbo1959 I'm away at the moment, I'll check what I still need and what I have that you need at the weekend. Hi, I need : 17 30 43 61 103 105 & 137. Got pretty much every other card for trade. PM me. Just 17 different cards from 15 packs! Definitely up for swapping. Trying to make up two sets for my kids. Just needing 1 x 30 (Strongman) and 2 x 93 (Gas Station) to complete my 2 sets - with thanks to those what are sending their swaps - so if anyone can help with the last few it would be much appreciated. After some sorting and trading we're down to this lot still required for my set and @SumoLego set we're shipping over. @Speedman29 can do 20, 24, 26, 34 x 2, 99, 113, 131 & 140. Will post tomorrow. A massive thank you to @Speedman29 & @Gibbo1959, I/we really appreciate your help! We're trying to complete two sets. We are two short of the first, but still need quite a few for the rest. Chris, another 19 on its way to you. I still need 17 30 103. Have plenty to swap. PM me. Seeing as it ends tomorrow, it appears I'm at the swapping stage. Have multiples of half of these too. Thanks @Mr_Cross for the swaps. Here's our current status. @RogerKirk I can do 3,7,11,42,53,65,68*2,70,80,83,86,87,94,98,108,112,113,124,128,129&134. If you message me your address I’ll pop them in the post for you. No swaps needed as I’m sorted for mine. @kizkiz can send you 1,2,14,21,29,32,36,46,49,50,59,63,64,75,77,85,86,88,89,108,111,114,120,123,124,127,134,135 & 138. Message me your address and I’ll get them to you. Many thanks to @gold682, @RogerKirk and @Gibbo1959 for the swaps so far. With many thanks to @RogerKirk and @gold682 we have completed the sets for my two kids... I'm now looking to find just over 20 for a set for me! @Mr_Cross can do 3,9,22,26,45,63, 76,86,90,109,116,120,121,131&132 from your list. Have your address so will sort this evening and post. And with a final thanks to @Mr_Cross I'm all complete! 30, 43, 47, 52 and 56. Thanks to @gibb1959 @kizkiz and @gold682 for agreeing to send me some cards. Is any one able to help out? Due to our local postman not being able to read road names we still need a number 19 card. Can anyone please help. 1 6 10 16 22 26 27 27 28 35 37 40 40 44 55 56 58 65 69 71 74 77 78 86 86 87 87 93 94 97 98 98 102 103 104 104 115 117 119 120 120 124 130 131 138. I'm not sure what doubles they have, although they take them to school so might not be in AFOL condition anyway! I do have a couple of empty albums I could trade though, or possibly other stuff if anyone can help tick of most of them. @CCC, I have a lot of those you can have. @CCC I have all of those bar seven (26, 69, 93, 119, 120, 120 & 130). I'm looking for the following: 3, 12, 19, 26, 33, 38, 47, 63, 64, 68, 69, 76, 116 and 130. PM me if you're interested in a trade. Apologies, @CCC. I've just double-checked my stack and it loook as though the kids have taken some to swap. I've only got the following you need: 1, 10, 16, 27, 27, 35, 37, 40, 44, 71, 86, 87, 87, 94, 98, 98, 102, 104, 115, 117, 138. Thanks both, I've just pm'd Mr_Cross and I will need to see what dupes the kids have. Just need #57 and #120 to complete my spare set. Got a few swaps to trade. 7, 8, 10, 11, 12, 13, 14, 15, 18, 19, 21, 26, 27, 29, 32, 33, 36, 37, 48, 49, 50, 51, 53, 54, 58, 59, 63, 64, 66, 67, 68, 73, 75, 76, 77, 78, 79, 80, 81, 82, 85, 87, 88, 91, 94, 95, 100, 101, 106, 107, 108, 109, 110, 111, 112, 116, 117, 119, 125, 126, 129, 130, 132. Still in need of 30, 43, 140x2 - if anyone has them. 1, 4, 5, 6, 9, 10, 12, 13, 14, 15, 16, 17, 18, 19, 21, 22, 23, 24, 2,5, 26, 27, 28, 29, 31, 32, 33, 3,5 36, 37, 39, 40, 41, 44, 47, 49, 51, 56, 60, 62, 64, 65, 67, 71, 74, 75, 77, 78, 79, 81, 82, 84, 85, 87, 90, 92, 93, 96, 98, 101, 102, 103, 104, 107, 108, 109, 110, 114, 115, 116, 117, 118, 119, 120, 121, 122, 123, 124, 125, 128, 133, 134, 137, 138. @darthdc - I have #120 if you still need it, but not #57. I'm also looking for sixteen of card 113, for a project I have planned, if anyone can help me out? Ok, so I'm a little late to the game with this series. I'm a primary school teacher and there isa boy in my class with various learning difficulties who would love a complete set of these. I've got him a book and managed to get quite a few cards but there are a lot that we will need to complete it. Got some swaps too if they can help anyone else. Any help with completing the collection is greatly appreciated. Just need 45 & 112 to complete 2nd set. Have too many swaps to list. Also happy to post to anyone who is looking to complete (ie. swap not necessary - if i have them for you i'll post em). @RogerKirk I have the cards you need. I am trying to complete some sets for some of the children at my youngest's school (did a swap meet for them at the end of term). I can do those 4 @Wookie2 PM me an address and I'll send them out. @SumoLego thanks to the various people on here who sent me missing cards. I had another 50 packs given to me by my mum who had been hoarding them since the start! Have plenty to swap, happy to help out where I can, so if you have those three I’d happily send you however many you need in return as long as I have them. 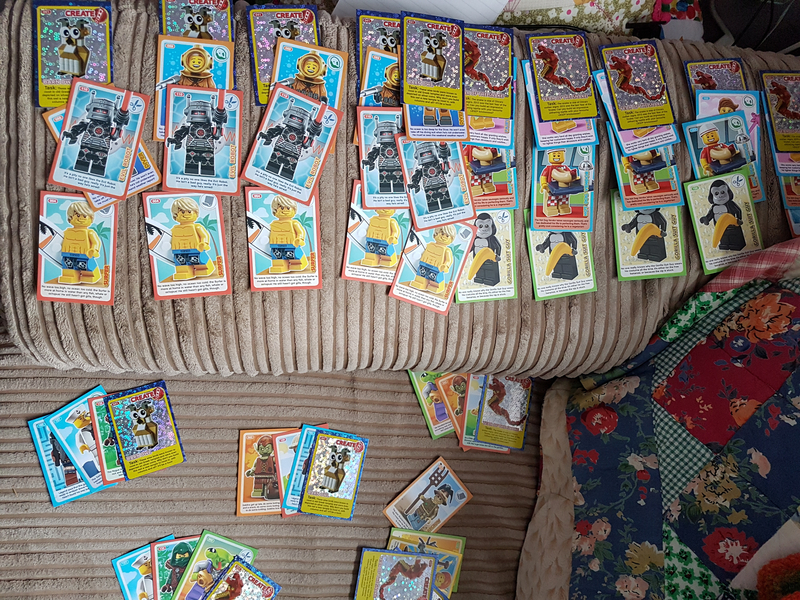 @Speedman29 thanks for your offer to check what you have, @Wookie2 has been kind enough to sort out the ones I need now, though, so my collection is soon to be complete. Thanks to Mr_Cross we are now down to a small wants list: 13 14 16 22 30 56 71 78 80 86 93 94 111 119. We do have about 10 duplicates but I need to find where the kids have hidden them. Thanks, I'll check what we have of your wants and get back to you.